A day trip to Boston from New York is great change of scenery if you are in New York for a longer holiday. Departing early in the morning, you’ll be in Boston before you know it, soaking up the rich culture of the city and learning about important people that once lived here. 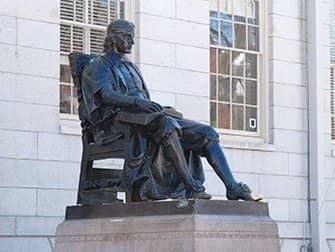 You’ll walk down the Freedom Trail, have lunch at Quincy Market, visit Boston Common and of course see the campus of Harvard. You first get off the bus at Harvard, for a quick tour around campus. After exploring the famous university, you re-board the bus to continue on to Boston. On the way the bus drives past another two famous universities: Cambridge and MIT. Next stop is Boston, where you disembark at Boston Common, a public park, and start walking the Freedom Trail. 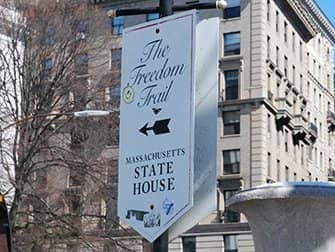 The Freedom Trail is a red brick route leading straight through downtown Boston, passing 16 important historical sites. Many of these sites are known for witnessing key events during the American Revolution against the British (taxation) in the 1770s. 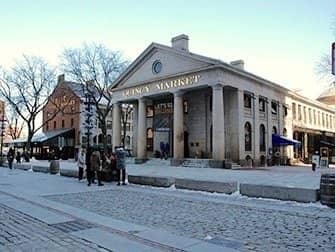 En route along the trail you will take a lunch break at Quincy Market, a food hall with all kinds of delicacies. 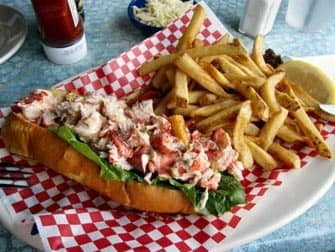 You’ll have time to enjoy a lunch of the Boston classics clam chowder and lobster rolls. When you’ve finished lunch you’ll head back to the bus which will bring you to the final stop: Boston Tea Party. The knowledgeable guide will tell you everything about the history of this site, and of course about all the other sites and areas you pass by during the day. Eric’s Tip: The drive from New York to Boston is quite long, but it’s absolutely worth it. The minivan or bus you travel in (depending on the amount of people) has wifi, so you won’t get bored. 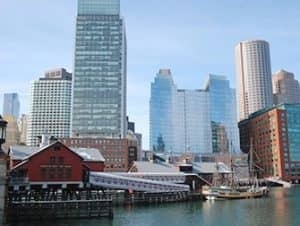 You’ll see a lot of Boston’s landmarks and get a good impression of the city, so if you have the time I would definitely recommend this trip. After purchasing, you will receive a voucher that you can print out or show on your phone as your ticket for the day trip.